So I took a stroll around my neighborhood and took identical shots of various objects with the two cameras for comparison. I set both cameras to full auto, which is not the way I normally shoot, but I wanted to test “intelligence” of the camera in choosing what it thought were the best settings for each shot. I tried to keep the field of view approximately the same in each photo, but it’s not 100% accurate, because the two camera sensors have different sizes and different aspect ratios, so it was a matter of me eyeballing the content of the frame. Click for 100% Crop. 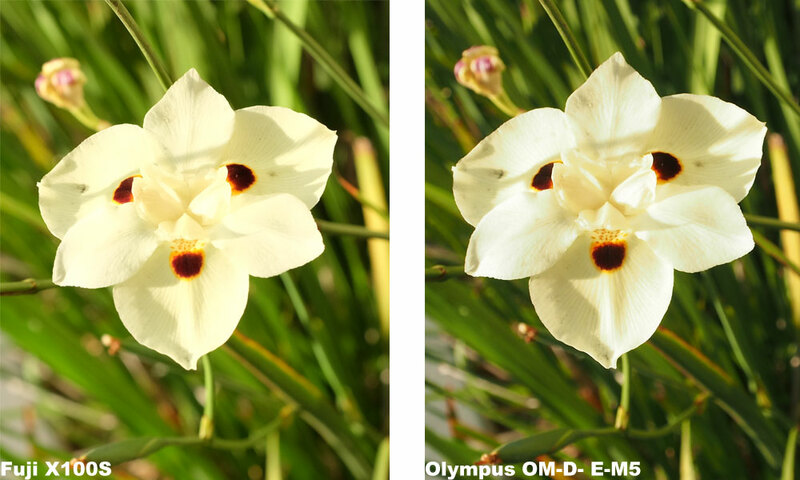 The Olympus looks sharper, but only because the Fuji focal plane was on a slightly different part of the flower (the Fuji f/2 lens creates very shallow depth-of-field). Fuji colors are warmer as usual. Otherwise, very similar photos. As expected, the Fuji usually wins in terms of sharpness, because its prime 23mm f/2 lens is one of the best on the market, and my kit 12-50mm f/3.5-5.6 zoom lens on the Olympus can’t really hope to beat a great prime. 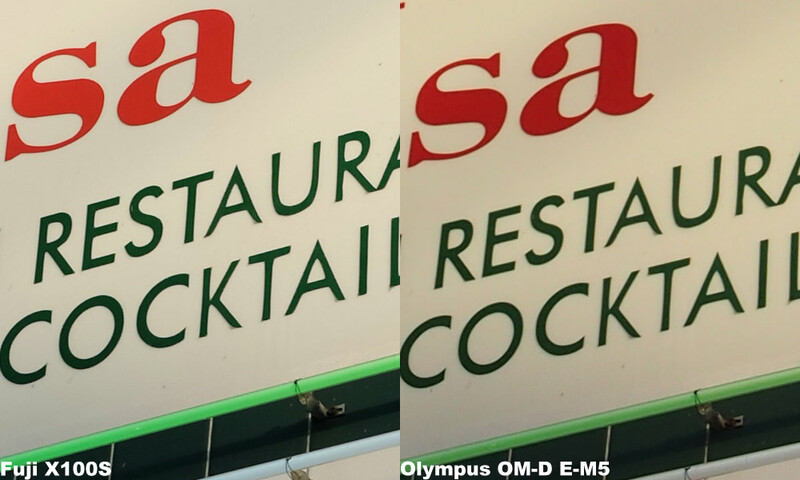 But what struck me most is just how good the Olympus kit zoom lens is. 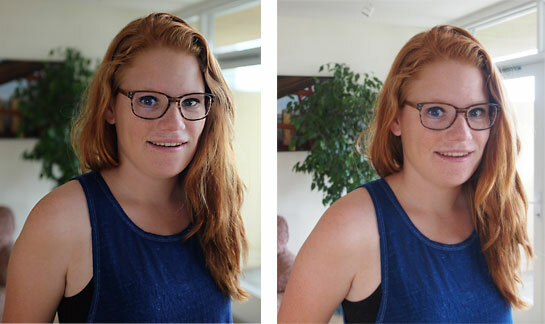 For most day-to-day photo purposes, its quality is more than adequate, and after being resized for the web you would usually not even notice the difference between the two cameras. Pixel peepers trying to get that last razor-sharp bit of quality will still usually prefer the Fuji. Click for 100% crop. No camera test is complete without beer. Here, the Fuji has a slight sharpness advantage and warmer color, but most noticeable is its softer background bokeh because its f/2 lens is wider than the f/4.3 that the Olympus comes up with at this focal length. You can clearly see a sharpness difference favoring the Fuji in some cases, but in one shot the Olympus was sharper, probably because the stabilization helped me hold it more steady. This is not to be overlooked, especially in low-light photography. The sharpness of the lens is not the only factor that makes for sharp photos. Click for 100% crop. Olympus wins this time! Probably because the stabilization feature kept my hands steady, while the Fuji shot is blurred from camera shake. The Fuji also has an ISO advantage in low light because its f/2 lens is simply much faster than the Olympus f/3.5-5.6 kit lens. 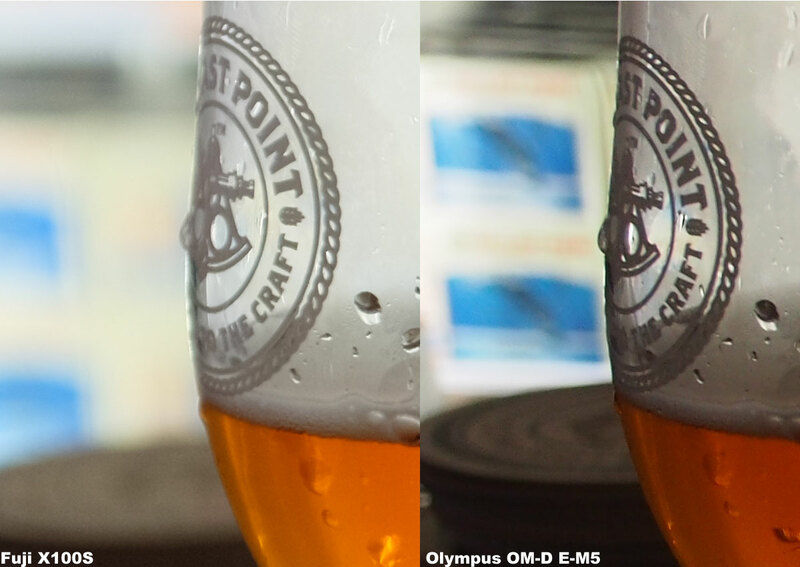 This sometimes forces the Olympus to use a higher ISO in identical conditions, leading to more grain. Click for 100% Crop. 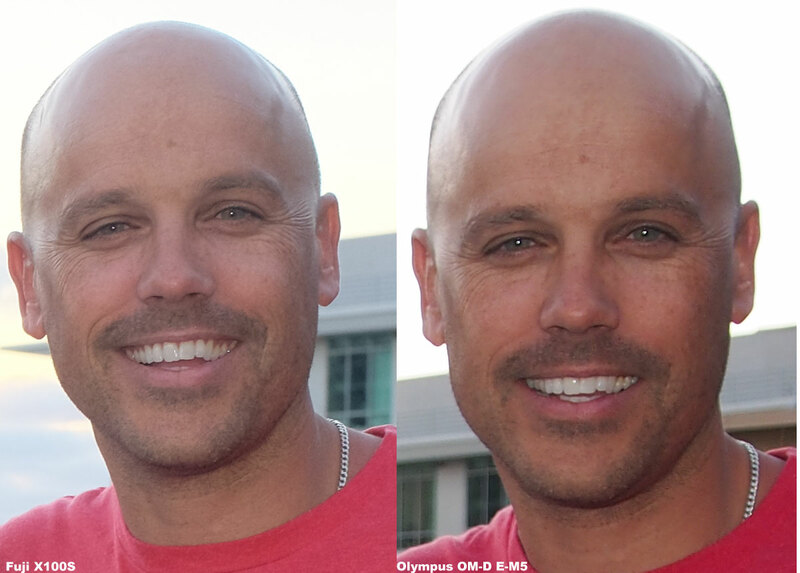 Here you see the difference in ISO forced by the difference in maximum aperture. The Fuji at f/2 was able to shoot at ISO 800, while the Olympus at f/4.5 had to go to ISO 1600. You can see the grain in the 100% crop. If I bought a faster lens for the Olympus, this factor would be equalized and the Fuji would no longer have this advantage. Cick for 100% crop. A test with fill flash. Here I am with photographer/teacher Brent Mail who flew all the way from Australia to have a beer with me. (Well, I perhaps he was also traveling around the US with his family). 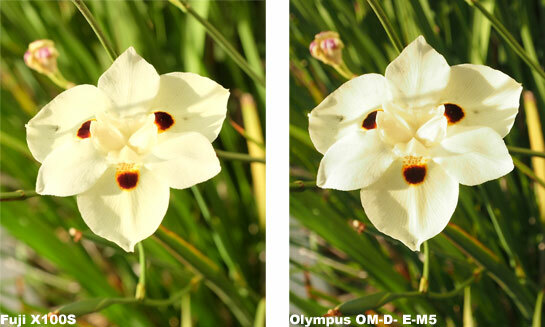 The Fuji has a built-in flash, the Olympus comes with a small hot-shoe flash. To me the Fuji looks sharper here. 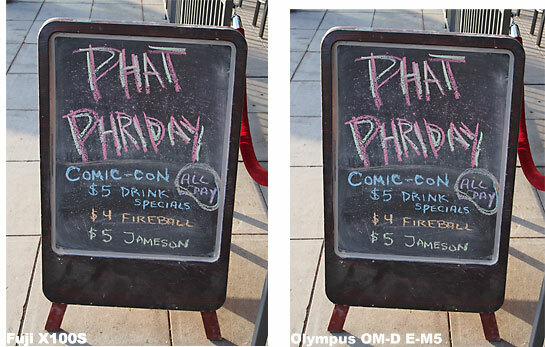 The bottom line for me in this test: Because the Fuji is world-renowned for its image quality, I expected to see more of a difference, and I was pleasantly surprised by how well the Olympus with its inexpensive kit lens performed. 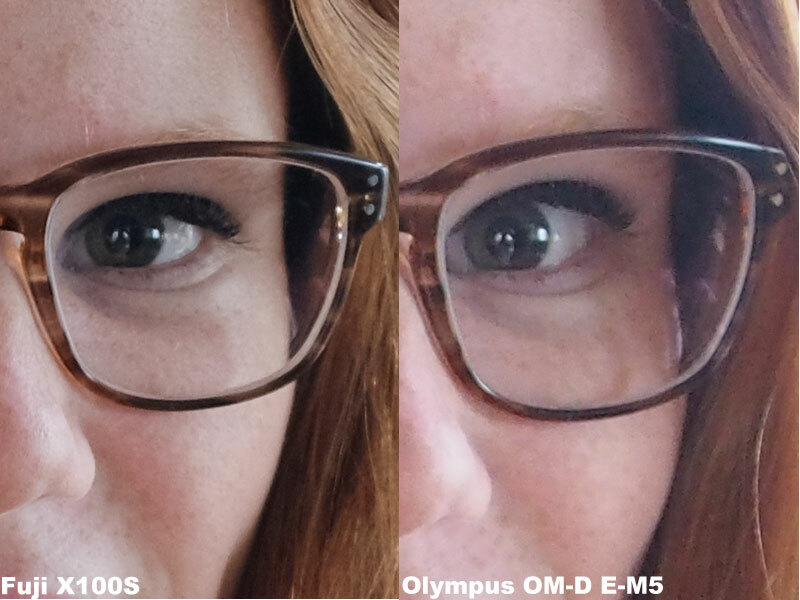 A better lens on the Olympus would close the gap even further. I’m not familiar with either of these cameras. However, to my eye, the extra sharpness in the Fuji examples seems to come from a sharpness enhancement (I assume in the camera) rather than from better glass. Have you investigated the Fuji internals enough to say whether or not this is really the case? Just to expand a bit on my previous comment, which was probably too brief, If you look at the 100% crop of the last photo, with Brent Mail, and look at the upper right edge of his shirt, as a very obvious example. A software sharpness algorithm has an unwanted side effect of edge enhancement, and you can clearly see it happening in the white line that appears in that place on his shirt collar. The Olympus is much less sharp, but if the Fuji sharpness was due to better glass, instead of a software sharpness enhancement, it wouldn’t leave a white line artifact in its wake, just sharper edges without edge enhancement. Thank you for the post. In my opinion, the Fuji is too limited with the fixed lens. 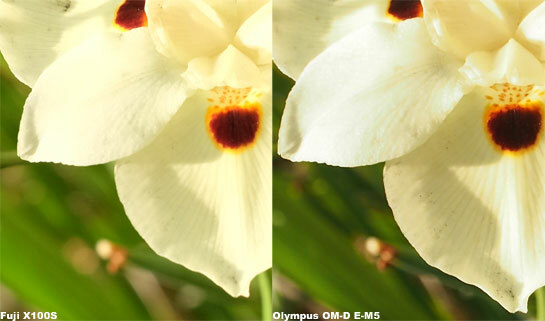 I own the Olympus OM-D E-M5 also. I purchased the new Olympus Zuiko Digital ED 12-40mm f/2.8 Pro Zoom Lens. This lens was designed to accompany the OM-D E-M1 Pro camera, but this lens is outstanding on the E-M5. You should consider this if you are going to keep the E-M5. I think it would compare quite well to the Fuji and offer the zoom plus interchangeable lenses. Try a comparison with the 17mm F1.8 on the E-M5 and the you would have a better idea of the true difference between the cameras. 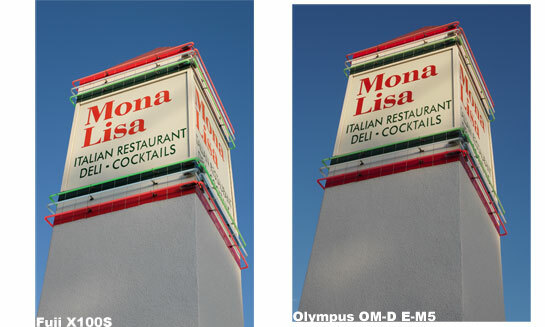 Since one camera has IS and the other does not, the comparison should require the use of a tripod to eliminate a variable. Thanks for your comments, but actually, putting the non-IS camera on a tripod to “eliminate a variable” is exactly what I’m NOT trying to do here. I’m not trying to be Consumer Reports making a laboratory controlled test of lens sharpness. I’m trying to show what happens with these two cameras in their standard configuration, at the same price point, in the real world, using them the way I actually use them in the field. And this goes for the similar comments requesting a different lens on the Olympus, etc, etc. Sure, that would be fun and interesting. And there are lots of pixel-peeper sites making those apples-to-apples comparisons for you. But my purpose here is different. I want to show you what you can expect if you buy these two cameras — the two that I found interesting enough to buy for my own personal use — and use them in their “factory default” configuration. Walking around in the world like a real person. Sure I could put the non-IS camea on a tripod, but the whole point was to show that IS helps, not to try to eliminate the difference. 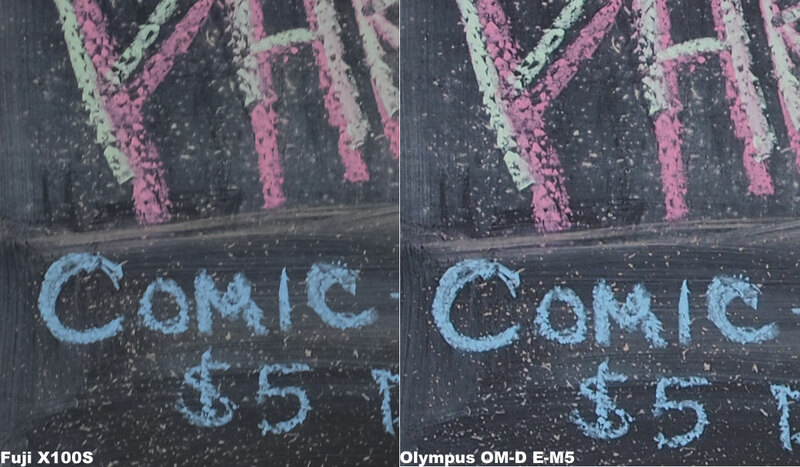 And I could buy a $1000 sharper lens for the Olympus to “even up” the performance, but the whole point is to show how it performs in its default configuration, where the two cameras are roughly at the same price point. So I hope that clarifies my goal here. I’m not buying these cameras in order to try to make scientific comparisons with all variables eliminated. I’m buying them to use! In the most common configuration and at roughly the same price point. And then I’m sharing with you what happens when I use them. I have a Panasonic M43 which is non-IS and was wondering if it is worth the expense to convert to Olympus bodies for the IS. Nice real world comparison. I have to admit, I’m a Fuji fanatic but I’m also a realist. After my trip to Europe and seeing the results from my X100S and X-Pro1, I am totally satisfied with my decision to go with these cameras for my travel and walk around gear. But I won’t say this is the best system. It is the best system for me ( I love the hybrid view finder and overall ascetics) but “best” is subjective. Pretty well all the camera manufacturers today make great cameras and you will get similar quality from pretty much all of them. Each brand has it’s strengths and weaknesses so research the net to find out what these are determine what is important and what is secondary when it comes to the camera’s capabilities. I found comparisons like this to be very helpful when I was deciding on a new system. I made the right decision going with the Fujis but it might not be the right choice for someone else. The bottom line is finding a system that works for you, the type of photography you want to do, and the budget you have to build it. Hi Phil, Well said. I think most people would find this comparison useful in the real world as most just want a good result for their images. With the majority of people also putting their images on social media sites they are possibly not to worried or aware about the pixel war, or some other technical detail and algorithm sharpness. I if you are printing 1×2 metres or bigger size prints for a gallery this will be a major factor. I have just returned from Europe and spoke with many people in different countries and asked why they bought their particular brand of camera, and quite a few said “I liked the colour” or “my friend had one and the pictures are great” Nobody talked about pixels bar a few with Sony A7-A7r and the large Nikon’s and fro the thousand of people walking around, I was one of the few with a tripod. Keep up the good work. As I said in my comment on your previous post: I love Fuji x100s for it’s capabilities, simplicity to chose setings from auto to manual and retro look. To compare this two cameras just on picture sharpness is nice and I’m glad that Fuji is slightly better (cause I own it). Which one to buy is just the question of photographing philosophy and needs in usage. Fix lens, to someone, could be disadvatage. To me, changeable lnses have many advatages and one major flaw – sensor gets dirty after some time. Cause I’m hiking a lot, I throw away my Canons and for last seven months i use nothing else but Fuji. Light, easy to chose settings, nice video, low light shoting… But, throughout this time i found serious production flaw: The camera is very porely protected against inside moisture! My back screen and eye screen got blurred so viewing was impossible! And mechanism of OVF is still stuck! Something I would’t expect for this type and price! But I continue to love it!